License and airtime free professional grade wireless communications! We heard what you wanted in personal communications! One word of advice - Never believe the range claims of most 2-way radio sellers. It may be true that couple of VHF radios operating without a license (and presumably without interference of any type) can communicate over distances of up to 20 miles IF one of you is on the ground and the other is straight up in the air at an altitude of 26,400 feet. Be forewarned if you are going to try this in a hot air balloon - take oxygen, and keep a sharp eye out for commercial aircraft. Depending on your location, a distance of 1 to 2 miles would be a reasonable expectation for portable-to-portable communications, up to 5 miles using an external antenna when used in vehicles, and up to 10 miles when talking portable to fixed station with a good antenna system. For additional information, click here. There are only five MURS frequencies available for business, institutional, or public safety use. 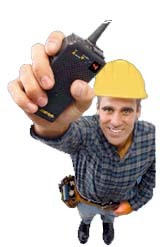 The radios must be FCC Part 95, Subpart J approved. As mentioned on our Home page, there are only two manufacturers of commercial grade portables - Motorola, with the RDM2020 and RDM2080D models, and Ritron with a complete family of portable products for MURS. The JMX Series is available in your choice of a 1.5 or 2 watt model with up to 10 channel capability. Five channels can be allocated to MURS use, while the remaining five channels can be used on any approved Part 90 frequency as well as the National Weather Service. Additional product information is available by clicking here. Our newest offering is the PT-150M which is designed exclusively for use on up to eight channels. This allows different MURS frequencies to be set up with different calling codes for selective addressing and/or private communications. Call us at 205.854.2611 for additional information. The PT-150M has built in 2-tone selective call, an extra long life rechargeable battery, an alphanumeric display, micro-sized, lightweight and MIL-SPEC rated. It is truly the best MURS radio that money can buy, yet competitively priced. Click here for more information!